The green movement swept across the country more than a decade ago promising to change the way we thought about things like energy efficiency, recycling, waste, and the environment as a whole. And while it brought it us some environmental awareness as a society, it’s my opinion that in 2019 we can officially write its obituary. Back in 2006, the whole country was awash in green products and television shows on HGTV and DIY Network. We were all cajoled into buying carbon offsets from companies like TerraPass. Even major manufacturers jumped on board and began creating “green” product lines in everything from household cleaners to T-shirts. The future was going was green and the skies would be filled with rainbows and butterflies. I too felt the excitement of changing the world with green ideas. I even had a television show called The Green Life all about living a green life that was optioned by a production company, but sadly never came to fruition. Things didn’t exactly turn out the way we hoped. So, why was that? What happened? The whole premise behind green products and a green lifestyle was to live in a way that did no harm (or at least less harm) to our planet and ecosystems. While I still see this as a noble goal, and one that can be attained by individuals, in 2019 I recognized that it will never happen in a way that will make a dent. America has taken the red pill and gone down the rabbit hole with Neo and Morpheus (pardon the Matrix reference) to an alternate worldview that we can no longer awaken from. We are now a culture with a replacement mindset, and a replacement mindset is the complete antithesis of green ideals. We don’t fix things anymore. When they break, we throw them away and buy a new thing. Got a hole in your sock? Tell me the truth, do you sew it up or throw it away. If I’m being honest I’m talking to myself here too! We have access to so much stuff now at such low prices that repair is just not worth our time. Trash it and replace it. We have applied this same principle to everything from socks to buildings. We tear down old buildings because…well, because they are old. Not because they are too far gone to save, but because we want something new. We have been so conditioned to think that newer is always better even though that is only occasionally a true statement. The green movement cannot truly thrive in a country where we throw away so many perfectly good things, even if we replace them with organic, pesticide-free, sustainably grown, ring-spun cotton. I’m fairly libertarian in my political views. Usually, I’m a live and let live kind of fellow, and in this case my libertarian stripes shine true because I believe strongly that freedom always trumps regulation even if this statement flies in the face of what I’m about to say. 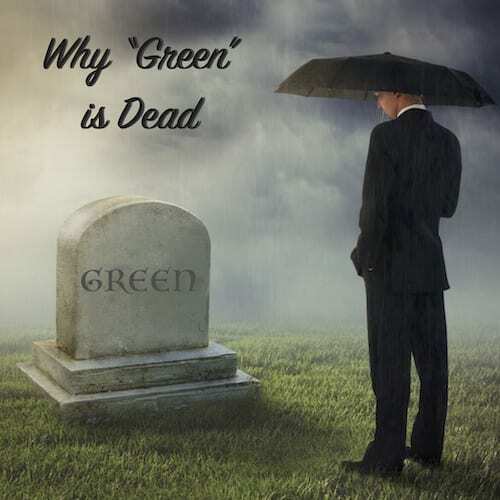 Corporate America destroyed green products. The first products that came to market were truly green products. Companies like Tom’s of Maine and Whole Foods were doing green and good for the planet products before it was cool. Then the green wave hit America and every major manufacturer created a line of “green” products whose “greenness” was only label deep. The public stopped trusting that what we were actually getting was a green, responsibly manufactured product that was actually good for the environment and largely went back to the old standard products our grandparents used. The idea of green products was diluted so far that all the taste had gone out of the movement. We had a major financial meltdown in 2007 and 2008 right when the movement was picking up steam. As is understandable, people turned inward to focus on self preservation. The environment and more premium priced green products took a backseat while we all struggled to pay our bills. Then in 2016 when the economy finally exploded again, it was go, go, go to make hay while the sun was shining. We were too busy working our tails off for more money that we got sloppy and wasteful, as is our nature. It seems like green just can’t catch a break. So, where do we go from here? The world has changed a lot in this last decade. We seem to have moved on from the original green ideals to new things. Better things? Who knows, but from my vantage point, the final nail has been placed in the coffin of the green movement and the world is left to figure out where it wants to go from here. After a decade of poor health and abuse, our dear friend Green passed away peacefully in her sleep. Born in 2006, a once vibrant movement with hopeful proponents set to change the world, it wasn’t long before she was battered and abused on all sides by corporate mis-management, insane economics times, and a culture that never really understood her. She leaves behind a growing community of makers and DIYers that hope to one day carry on the ideals that she once so proudly stood for. Green is dead, long live Green. The post Why “Green” is Dead appeared first on The Craftsman Blog. Previous Post Is Finger Joint Lumber Worth It?